We've been nominated for the Filmmaker award at this year's Sapporo International Short Film Festival! It is a huge honor for us! There are only three other nominees and they are all accomplished, amazing filmmakers: Mohammad reza Hajipour, Don Hetzfeldt and Johannes Nyholm. 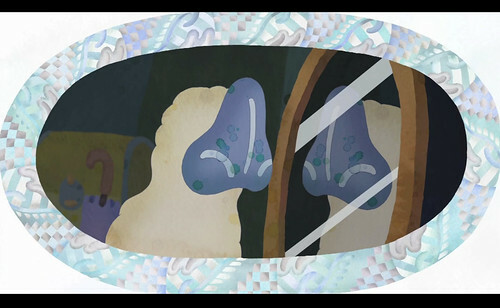 We will be screening five of our animations at the festival: Rhubarbidoo, Bryum & Kapok, BLESS, Halfway and Ludic Chase. We will have more on the schedule dates and time, but the festival is from September 9th through 17th and best yet: we will be in attendance! MAGI NIGH Lodge and Projecting Together are finished but the many Tokyo events are just about to begin! We've introduced them here and there in their own posts, but realized it would probably be wise to present a single schedule for convenience. We want you to come to all of these!!! 5/5 & 5/6 MAGI NIGH Wayfinding - neighborhood/personal constellation making workshop! 5/8 MAGI NIGH Ritual Exchange - music, live drawing, live scoring, screening extravaganza at Super Deluxe! Wayfinding spots are filling up so reserve either a Saturday or Sunday slot now at magiunion@gmail.com! If you need a refresher of what we'll be doing take a look at our post on the event or feel free to ask us directly! Also, there is some concern that there may be too many people to allow into the Ritual Exchange event, considering the artists lined up and the holiday week, so please reserve a ticket at magiunion@gmail.com if you are interested in attending! Again, details on this event can be found at our post or ask us directly. We've mentioned it briefly, but the MAGI NIGH tumblr is now officially up and running! Managed by the Magi Union (essentially us and an amazing couple who we will introduce in another post! ), it is the place to go for all things MAGI NIGH. Most of the site is only in Japanese at the moment, but there is a growing, lovely collection of images to browse, and all the basic event info (date, location) should be easily understandable. I am trying to catch up and make all the posts available in English as well! So keep checking back! We'll be writing on each of these events, starting tomorrow! Any questions about attending these events can be asked to us directly or to the Magi Union (magiunion@gmail.com). And there is also a Twitter page that has just been set up, if that is how you prefer to receive your news! "When the democratisation of technology means that the means of creative production is lead by technology not creativity it's refreshing to see moving art which moves you, engages the viewer, tells a story. I was hoping for something like this, something that expanded and communicated a concept rather than just being one." This is really only pertinent if you can read Japanese, but the wonderful Japanese site, Public-Image, which focuses on artists, designers and other creators just put up an interview they did with us! It's the top story and really a very nice interview, performed and written up by the talented and extremely prolific Yuki Harada during our Summer trip to Japan. They actually wrote a bit about us in 2007 when Rhubarbidoo came out, but this is our first interview for the magazine. The interview is very detailed concerning Overture's beginnings and goals and we are extremely grateful to have this opportunity! We hope this helps us find more work in Japan and possible exhibitions as well! Oh, and also out today is an article on Overture in the magazine, Quotation. Quotation is a Japanese magazine that I think is bilingual... we'll be receiving a copy shortly and will write a fuller report on the article then! Our site has undergone some changes! It's not spectacularly more efficient or snappier, but it is more informative! There are pages for most of our animations and illustration projects, including those for the MoonHare and Dreamer illustrations we created for the exhibitions we had in Japan this Summer. In general, the space is now more useful! A little late in posting this, but BLESS has been nominated for the Vimeo Awards in the music video category! There are currently 19 other nominated artists in the category but this will be whittled down to 5 today (9/21! ), according to the website. So we're biting our nails a bit, but either way it's a great honor to be nominated alongside so many talented folks! We've also been invited down to attend the workshops and ceremonies they have going on during the festival (10/8 & 10/9), so regardless of today's results we'll be in the city that weekend! A new animation! A very very very brief animation (30 seconds) for video site Vimeo's upcoming film festival. We drew it just before leaving for Japan and put it together after arriving. It was a great deal of fun! The music is by our good friend Magical Power Mako and though the clip is short we are still very happy to finally have an opportunity to work with him! Certainly we will be working together again in the future! 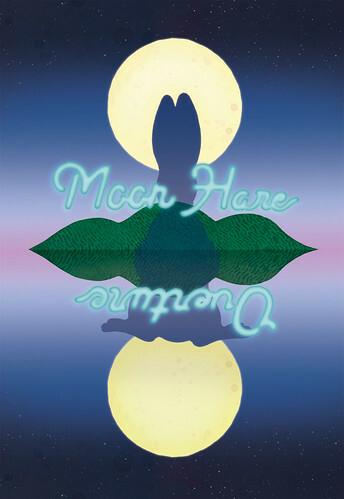 Our MoonHare exhibition at Gallery Blue Ballen wrapped up last Friday and we wanted to thank Ura-san, Tomoko-san, Hirakawa-san and everyone who came out to Yufuin to see the show! It was a wonderful success and will surely prove to be a seed for future projects in Oita-ken. Another festival announcement! This time it's the KLIK! festival in Amsterdam, September 15-19th. I thought we had written on this earlier as it was decided a while ago - but they only just recently uploaded the schedule so maybe we had been waiting on that. We will be screening Bless at the festival in the Commissioned Animation Competition. We have never screened in Amsterdam and the KLIK! lineup looks really great! Should be a fantastic festival! Switzerland! Just a quick note that BLESS is screening in the Swiss animation festival, FANTOCHE this September! It will screen in the Animated Music Clips section along with a selection of incredible and intimidating videos. We are very excited! Did we mention this previously? After our exhibition at Gallery Blue Ballen we are touring Japan! And with the wonderful musicians of Sheeprint! 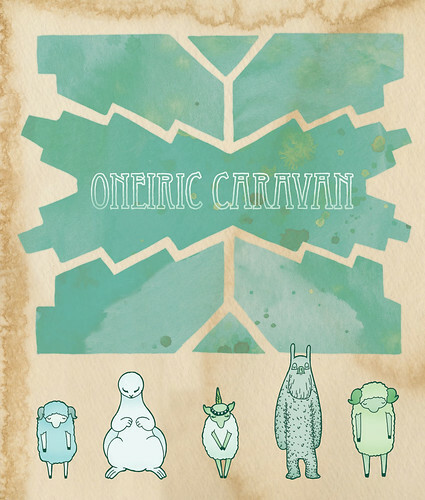 We are calling it "Oneiric Caravan", mixing our Storytellers performance of storytelling and animation with the live music of Sheeprint and other guests to create an engaging and dreamy experience. Yo Gabba Gabba! just released a new DVD, "Clubhouse", collecting four episodes from across their three seasons. One of these episodes is the "Animals" episode which includes the animation "Animal Sounds" we created! The DVD is available for purchase right now on Amazon for $16.99 ($12.99?) as well as at other retailers both online and physical. Graniph, the brand we designed a Ding-Dong Yeahs ancestor t-shirt for back in 2007, recently opened a kind of showcase site called Graniph Labs. They introduce different interesting events and things their associated artists have going on. I'm not exactly sure when the site when up and I haven't figured out all the nuances of how they have things laid out, but they recently put up a number of our animations, including Bless! Take a stroll around the site and see what other folks are up to!